It was in 2013, just as director Emer Reynolds and producer John Murray realised a shared obsession with the Voyager space-probe mission, that Nasa announced that Voyager 1 had left our solar system, making it the first man-made object to enter interstellar space. Reynolds, Murphy and co producer Clare Stronge rounded up cinematographer Kate McCullough, film-score maestro Ray Harman and a host of other leading home-grown talent and got to work on a feature documentary to chart the inception and journey of this extraordinary scientific venture. Four years after that moment (and 40 in total since Voyager 1 was launched), The Farthest arrives as not only one of the finest film projects ever completed with Irish Film Board funding but one of the big-screen events of the year. Toilet humour, teacher-snubbing classroom anarchy and wildly silly imagery are the pillars of the Captain Underpants brand. Add in a dash of controversy - the American Library Association is said to have received a raft of complaints about the books over the years - and the result is millions upon millions of young subscribers around the world. This spry and furiously giddy movie adaptation from DreamWorks Animation will prove most useful in converting even more legions of followers to Captain Underpants in territories beyond its native shores while also providing thoroughly good entertainment. 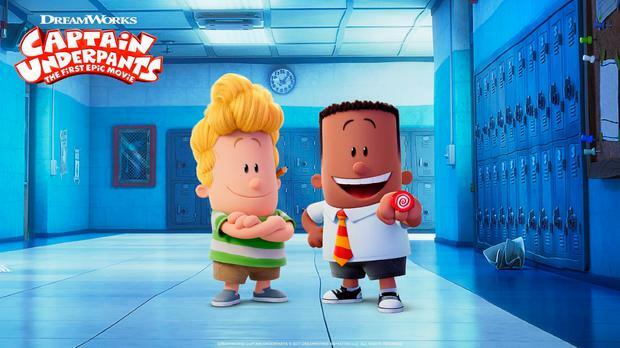 Fourth-grade messers George (voiced by Kevin Hart) and Harold (Thomas Middleditch) are fed up with having all their fun ruined by dastardly headmaster Mr Krupp (Ed Helms). They accidentally hypnotise Mr Krupp and turn him into the titular superhero of their home-made comic book. While not the brightest, the Captain's superpowers could come in handy because a pint-sized villain called Professor Poopypants (Nick Kroll) is intent on turning the schoolkids into humourless zombies. Matthew Heineman made a name for himself with the Oscar-nominated Cartel Land, a perilously up-close examination of Mexico's drug wars. City of Ghosts sees the US documentary-maker back at the coalface of another grisly conflict, albeit this time one muddied with a range of expanding complexities. The film tells of a group of citizen journalists that arose during the Isil occupation of Raqqa. Calling themselves "Raqqa is Being Slaughtered Silently" (or RBSS), they risked much to transmit to the world the truth of life under the medieval cruelty of the caliphate. When sniffed out by Isil and placed in their crosshairs, they flee Syria to Turkey and Germany but keep working. Some are sent videos of friends and family being executed as retribution, but still they persist. Christopher Nolan has done it again, and his much anticipated Dunkirk is quite simply excellent. Ambitious, emotional, impressive, beautiful, terrifying and superbly cast, it's a fitting testimony to one of the most remarkable episodes in modern warfare. Nolan, who wrote and directed, does so from the perspective that his audience knows the background. We meet Tommy (Fionn Whitehead) as part of a group of British soldiers wandering through Dunkirk town, presumably with orders to retreat to the beach. They're hungry, dirty, silent. German propaganda leaflets rain down on them. At the beach, lines of soldiers, some 400,000, await evacuation. German planes bomb them and the ships that come to take them away. This is the first of the story's three strands, The Mole (a jetty they used to board the ships). The second strand is The Air, where a meagre few Spitfires (the bulk of the air force and navy are held back in case of invasion) led by Farrier (Tom Hardy) give air support to The Sea, the civilian boats requisitioned to save the men in Dunkirk. Mr Dawson (Mark Rylance), his son (Tom Glynn-Carney) and George (Barry Keoghan) are civilians doing their part, their first rescued soldier is Cillian Murphy. Paul Whitington In 2008, Jessie Buckley came second in a now-forgotten BBC talent show called 'I’d Do Anything', which promised the victor the role of Nancy in a West End production of Olivier!.